Auditioning for America’s Got Talent was a dream itself. Even though the process was complicated and enduring, I met many different types of people and even starred as an extra in the show. I have always had a passion for singing. I took voice lessons when I was 10 and I’ve always had a blast performing in front of people. On Nov. 19, I decided that I was going to audition for America’s Got Talent. I knew that it was probably unlikely that I would get chosen among the millions of people auditioning, but I decided to try it anyway. You only live once, right? My parents and I loaded up from Stephenville and headed to Austin where the auditions were being held at the Austin Convention Center. We walked into a big holding room where all of the people auditioning were waiting. There were so many different acts. There were singers, ballet dancers, magicians, jazz players and even a Michael Jackson impersonator. The holding room looked glamorous. There was a black and white tile dance floor in the middle of the room along with fancy makeup mirrors surrounded by lights, and there were huge backdrops emblazoned with “America’s Got Talent,” on each wall. After waiting for an hour, one of the producers came into the room and called for numbers above 100. My number was 277. I thought we were leaving to audition, but I was wrong. I followed the crowd of people as we went outside, through another building, back outside and then lined up against the side of a building. I didn’t really understand what was going on. I eventually figured out that they wanted to get a “fake shot” of the performers waiting outside to audition. As my parents and I continued to wait, the producers kept coming in and out to liven up the crowd and get us “camera ready.” They told us to take off our jackets since the show airs in the summer. The producers told everyone to do their act at the same time. One by one, each act got onto the dance floor to show their act. But I didn’t have time to join them because they called for numbers 250-300. This was it. It was my turn. Again, I followed the crowd to a cluster of chairs between two doors. We assumed that we would go into the room in groups of four or five, but we were all led into one room at the same time. There were about ten of us in our group. Most people think that during the first audition you get to meet the celebrity judges, but no such luck. There was only one lady in her mid-20s with a computer and a camera to record our performances. There was an “X” marked with pink tape and we were supposed to stand there, state our name, age, where we were from, what song we were singing and an interesting fact about ourselves. We also only had 90 seconds to perform. I was the second to last performer so by the time it was my turn, I was starting to get extremely nervous. Once it was my turn, I pushed my nervous feelings aside and tried my best to look confident. I told the judge that I was going to sing “Have to Say Goodbye” by Jennette McCurdy. The judge nodded and I began. I think I did fairly well for how nervous I was and I was relieved when it was finally over. I felt sorry for the guy that was after me because he was the last one to sing and he ended up forgetting the words to his song. After everyone had performed, the judge thanked us and told us we would get a call in either January or February if we had advanced. I walked back to the holding room to meet up with my parents, but before I could make it over to them, one of the producers stopped me and asked me if I would walk in front of the camera multiple times for a segment. I was a little startled, but I said I would. He explained that he was focusing on filming a person or an object and we were supposed to walk in front of the camera to make the room seem like it was busier than it actually was. He explained that we would appear as dark figures to the audience so it didn’t matter how often we walked in front of the camera. One by one, me and four other individuals all walked back and forth in front of the camera for about 10 to 15 minutes. My parents were confused when I caught up to them, but I just explained it was another weird thing the producers made us do so they understood. 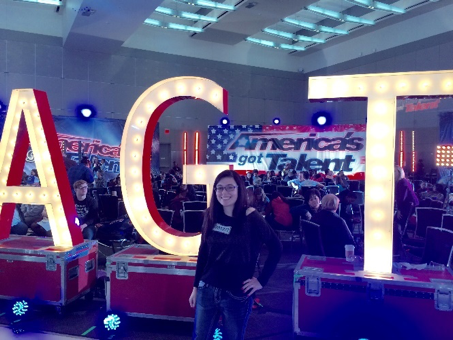 Overall, auditioning for America’s Got Talent was a weird, but fun experience. I learned that there are many tricks and secrets that go into making the actual show that most people don’t normally think about. I enjoyed getting the experience to audition for such a famous television show and meeting other people with similar talents and dreams. It was an experience I won’t ever forget and I would definitely audition again if given the opportunity.